With this product, a little goes a long way...I have sensitive skin and this is the only shaving cream I have found that does not make my face break out. I also use their shave oil and aftershave lotion. I bought Art of Shaving for my boyfriend a few years ago and have been using it ever since. I love that it's unscented so we can both use it! No more razor bumps or irritated skin. Recently we ran out before the new jar came and we both held out on shaving until we got more! We couldn't bear the thought of using a drugstore cream we had leftover. Love this! After years and years of my husband trying every shaving cream on the market he finally found a keeper. 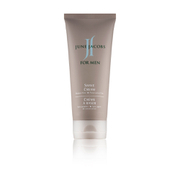 He has very sensitive skin and this cream makes shaving much easier for him. 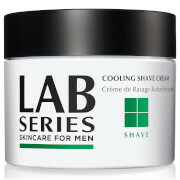 He says it is the first product that makes shaving "not hurt"! He uses a small amount applied with the brush and a Hydro 5 razor. One jar lasts about 2 months. I bought the unscented starter's kit as a gift for my son who has very sensitive skin, since the kit was advertised for sensitive skin.Unfortunately, he had a very bad reaction --breaking out into red rashes all over his bearded face and neck. Very disappointing since these products are quite expensive. I am a wet-shaver (meaning I use an old-school double edge razor, and apply cream with a brush).I like this stuff a lot; good value for the money, as a little goes a long way.It lathers well with my brush, and when I'm traveling and do not have my brush, I find it still lathers up well by hand.The only thing I've noticed is that when I travel, and do not bring either my brush or my double-edge razor, and therefore use my Sensor or Mach3, I get a better shave with this cream if I use very, very little of it. That is, if you are using a shaving cartridge, you have to be careful to use very little of this product, otherwise the cartrdige has difficulty getting through this thick shave cream.This is unscented, which I prefer. My husband and I have tried many types of shaving creams and almost always would end up with razor burn (me) or ingrown hairs (him). This is the only stuff we've used that helps. Husband has rosacea and this doesn't irritate him at all. I love that it's unscented, too. Used this for one week and it resulted in a massive ingrown hair that became infected and grew to the size of a plum. Also cause other smaller ingrowns across my neck. Horrible.